After continuing our sampling through the night, it was time to recover the BS3 mooring in the waters northeast of Barrow. The recovery of the mooring is quite an impressive process. 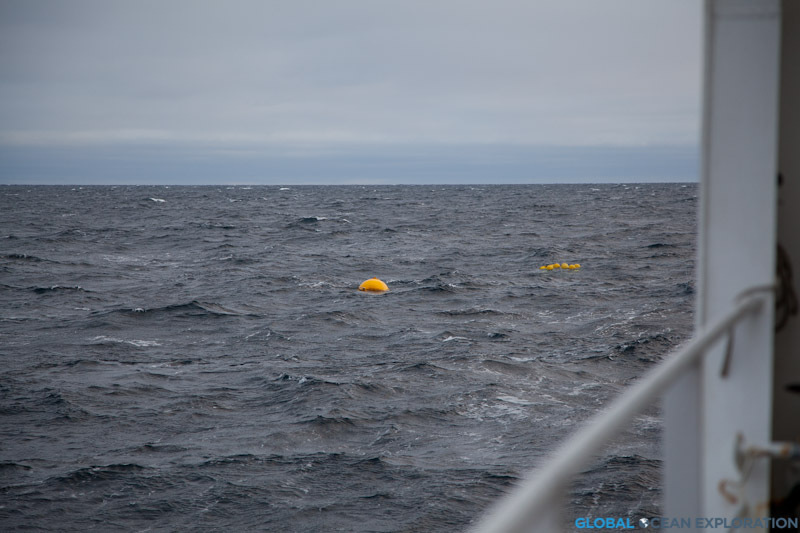 This mooring was deployed on last year’s cruise and has been taking measurements of the water column for the past year creating an incredible data set that is key to understanding the Arctic shelf ecosystem. The instruments on the mooring have been collecting various measurements including temperature, salinity, nitrate, pCO2, and pH. The first part of the mooring coming on board. The pCO2 censor is on the chain behind. Dr. Jeremy Mathis with his pCO2 censor from the mooring…excited to see the data! 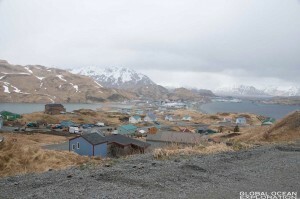 This entry was posted in Arctic, Climate Change, Ocean Acidification and tagged Arctic Ocean, moorings, oceanography on October 12, 2011 by Gaelin. 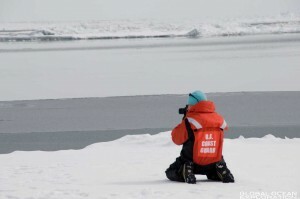 As we made our way through water sampling stations, we all anticipated the approaching ice edge. We were heading north so it was just a matter of time and we all hoped that we would come to it during the day. The day was cold and started out calm and cloudy but by midday the sun was shining although it was still quite chilly and the wind began to pick up. 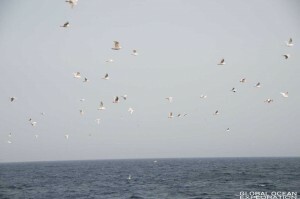 There were gulls and other small birds around the ship as we cruised north at 15 knots. The water temperature was dropping indicating that we were getting close to the ice. Shortly after dinner, the bridge made an announcement over the pipes (loudspeaker) that the Healy would be in ice in ten minutes. 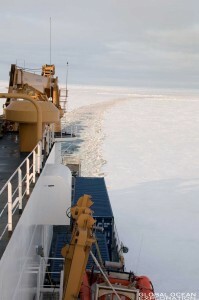 I quickly gathered up my cameras and headed out on deck and up to the bridge to see the approaching ice edge. It was beautiful with the sun shining. 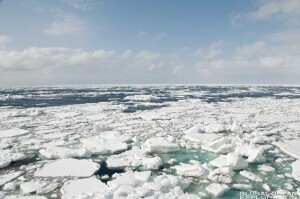 Large and small pieces of ice bobbed in the water. The ship cruised right through and it was quite beautiful. We did some sampling and then turned south and out of the ice to follow our research transect. We should return to the ice sometime tomorrow. Hopefully the sun will still be shining and we will get into thicker ice. 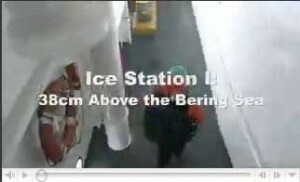 This entry was posted in Arctic, Bering Sea Expedition and tagged Bering Sea, Ice Expedition, oceanography on April 24, 2008 by Gaelin. 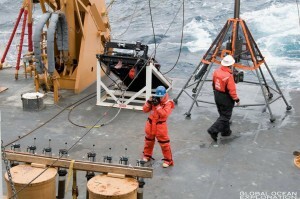 I have spent the past two days learning about the multi-core, a state of the art benthic (sea floor) sampling device. 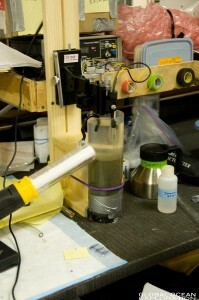 The multi-core is unique in its ability to preserve the sediment water interface while sampling. This is a critical zone for the exchange solutes between the bottom and the water. 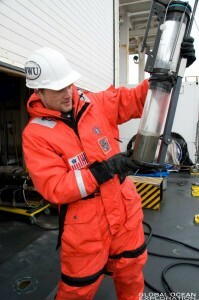 Nutrients, dissolved gases, and other elements collect in the bottom sediments and their interaction with the water above is one important element of the research being conducted by the researchers on this cruise. 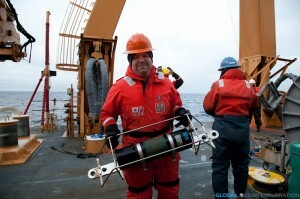 Paul Walczak, the coring guru, prepares the multi-core for deployment. 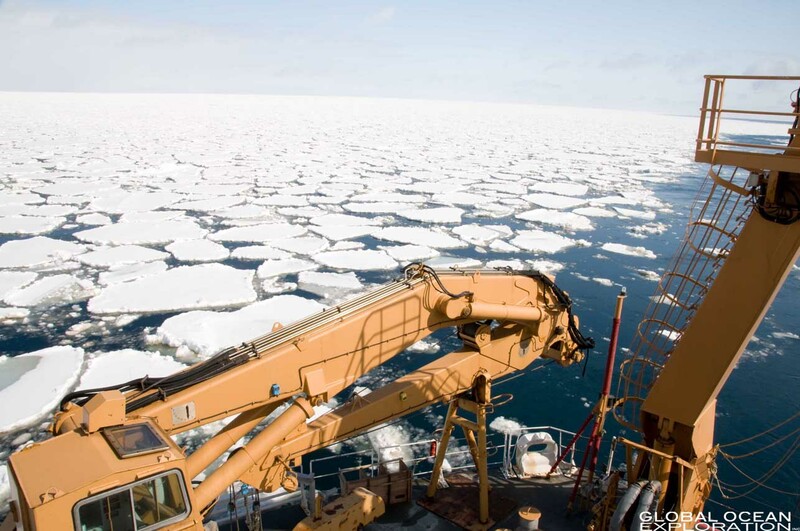 By collecting the information about the gases and nutrients, the researchers hope to unravel the mystery of how the ice melt and presence of more organic matter in the water column affects what is on the sea floor. 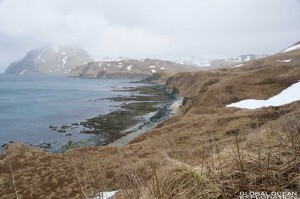 Will a larger food supply from increased ice melt and the following increase in mud-dwelling organisms increase or decrease the amount of nitrogen in the water just about the sea floor? These are the big questions that this group of scientists are trying to answer. Why is this important? The Bering Sea has a remarkably productive benthic system. 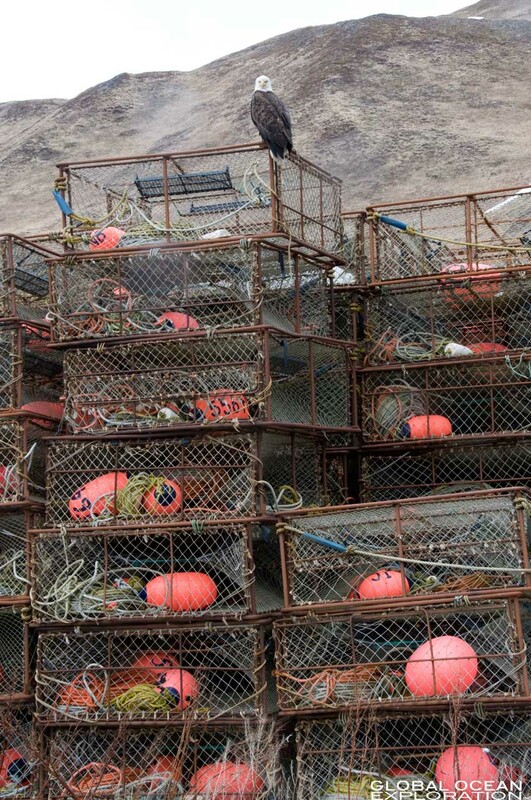 From clams and tubeworms to King Crab and Pollock, the exchange of nutrients from the bottom to the waters above is a key component to the food web. 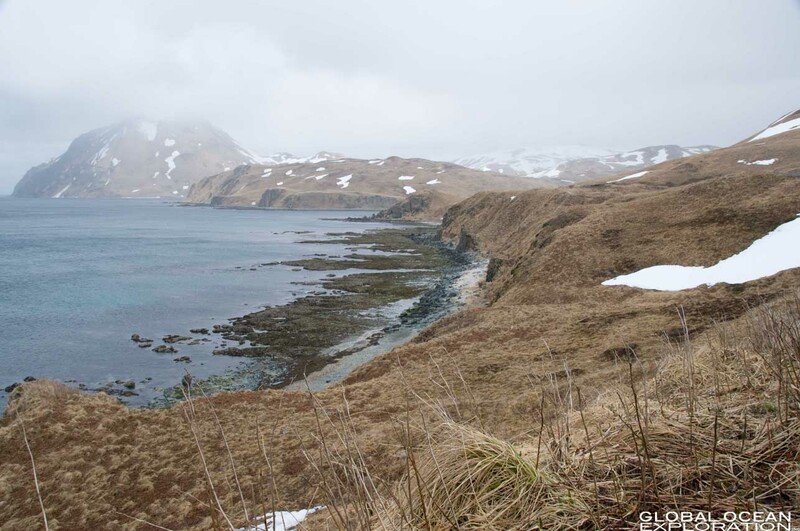 It is important to understand what are the limiting nutrients in the Bering Sea and how they affect ecosystem structure. Looking at what is in the water column and what ends up on the bottom and how it interacts with the sediments and its eventual return to the water column is of vital importance to our understanding of exactly what is happening here. 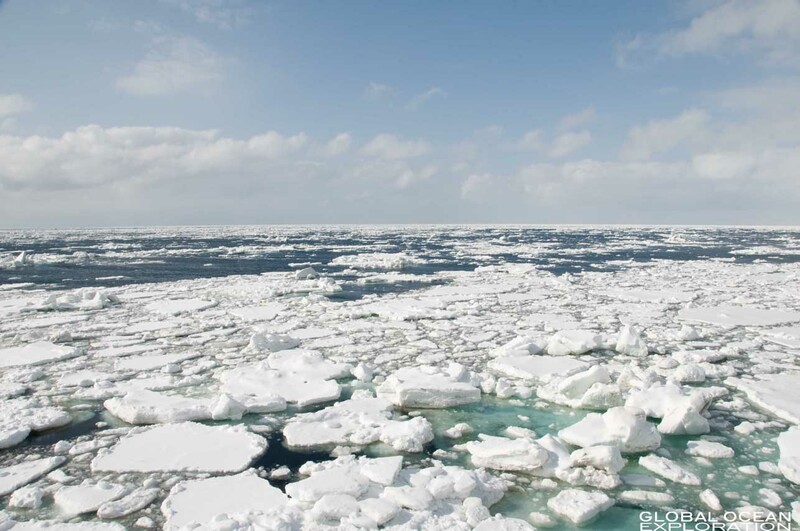 In our world of climate change, the effects that more or less ice will have on the system is of vital importance to gaining insight into what the consequences of changes in the ice will have on the entire system in the future. 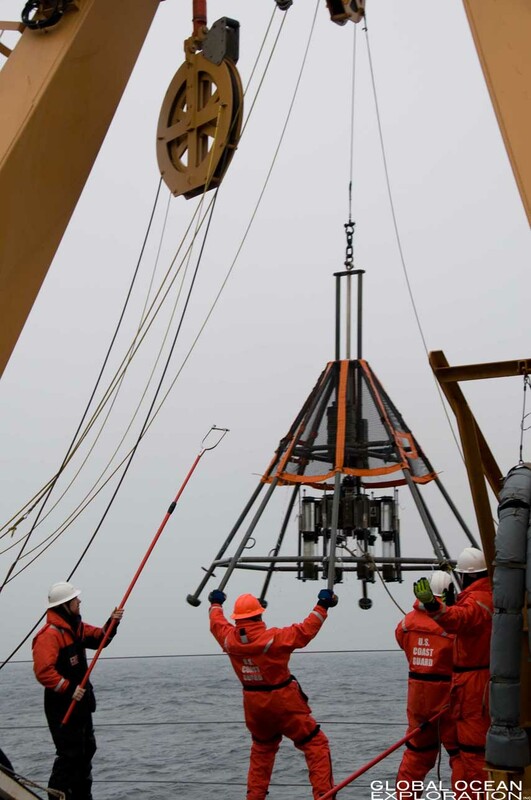 Bringing the multi-core back on board after collecting sediment cores at 3500 meters below. 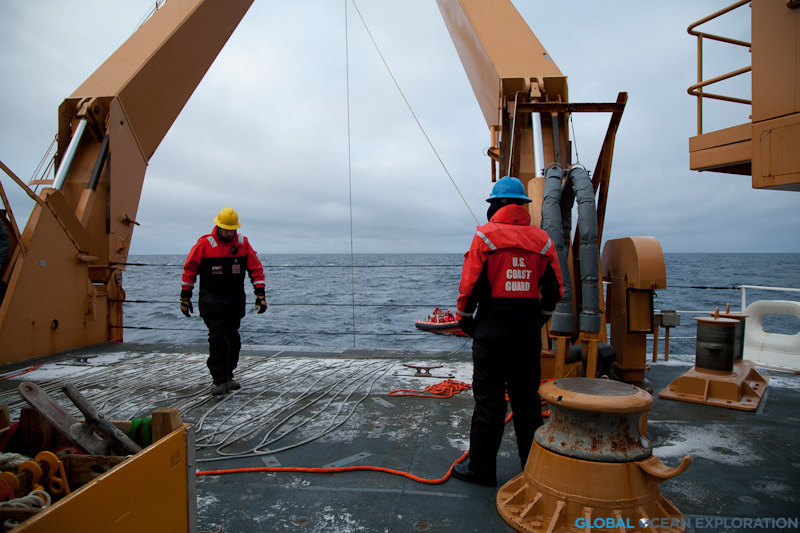 The winch and A-frame do most of the work but the crew on deck must guide it in gently to not disturb the samples or damage the instrument. 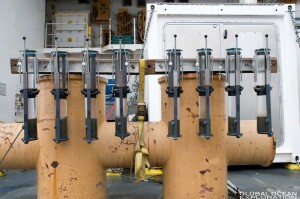 The multi-core can take up to eight samples each deployment. A good sample has clear water on top of the sediment and the interface between the sediment and the water should be undisturbed. Dave Shull examines a core. This is a good sample as the water above the sediment is clear. 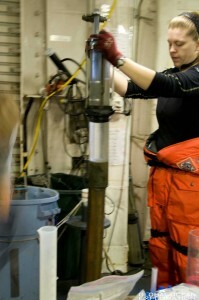 Heather Whitney takes samples from the core to process later. The core is carefully sliced in order to sample the various layers of the sediment. 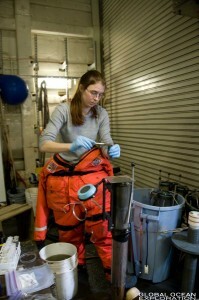 Emily Davenport gets ready to extrude the core from the sampling container in order to begin sampling. A core is sampled for oxygen using a specialized probe that records data and gives a profile of oxygen concentration in the core. 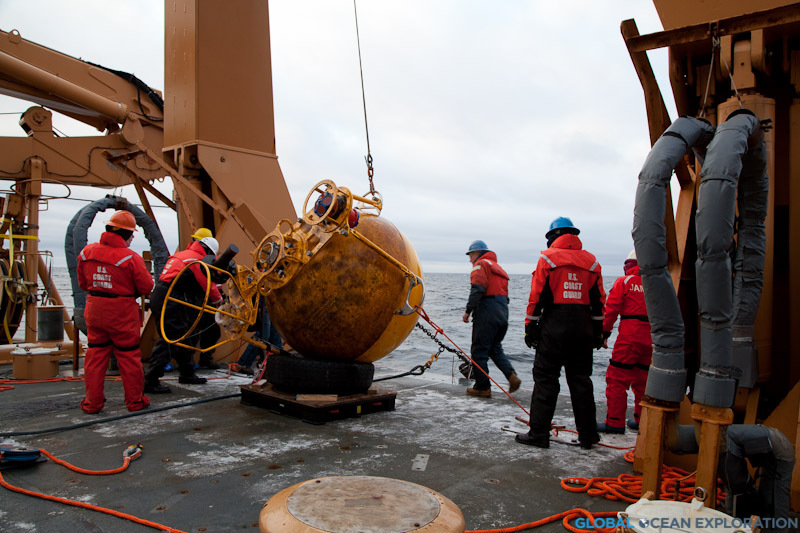 This entry was posted in Arctic, Bering Sea Expedition and tagged Bering Sea, Ice Expedition, oceanography on April 23, 2008 by Gaelin. 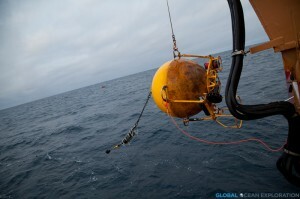 We are still in open water working at a deep station. The weather is beautiful with calm seas and bright sunshine. 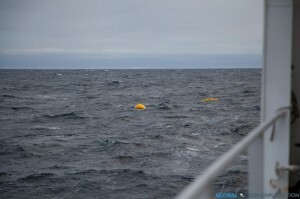 Yesterday some of the scientists deployed a floating sediment trap that drifts in the sea for about 24 hours until they go and retrieve it. 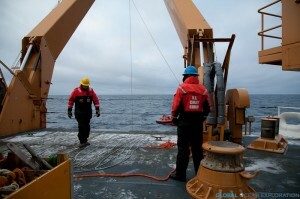 After completing the multi-cores, we head off to find and recover the sediment trap. 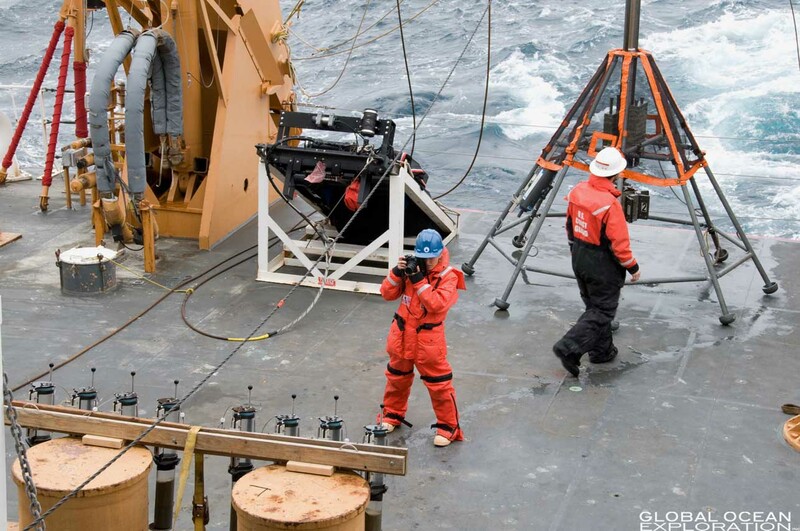 This involves a small boat being launched over the side and an elaborate plan to get the instrument back on deck with samples intact. The weather was on our side for this retrieval and it went off without a hitch. 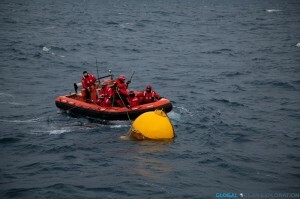 However, I would not have wanted to be in the small boat which was getting tossed around in the big seas. The evening continued to be beautiful with flocks of gulls and other small birds flying around the ship. Then it was time for the science meeting to determine where and what we were going to do next. 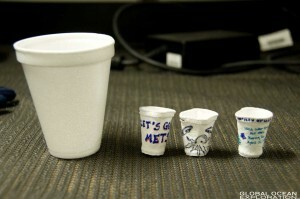 All of the scientists convened in the science lounge to discuss the plan. Most of the transect work and time specific samples had already been collected and we had a few days to work with before we needed to head up to our next definite sample site so the question of what all of the scientists wanted to do was the topic of the meeting. Carin Ashjian, the chief scientist, began by going over what we had accomplished on the cruise in the past few days and then outlined the options for the next few days. After compiling the input of all of the principal investigators, it was decided to look for an area of production where there could be a lot of phytoplankton and then head north to look for the ice edge. We should get into the ice sometime tomorrow evening so I am very excited as it has been a few years since I have been in a frozen ocean. 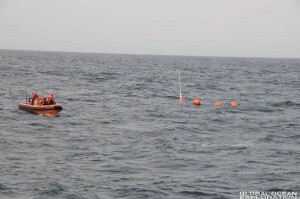 One of the scientists on board is conducting a “webinar” on May 1 at 2:45 EDT for anyone who is interested in hearing and seeing more about the science being conducted on the cruise. Here is some more of the information about the event. Emily Davenport, a member of the Multi-core team, is coordinating it. Hopefully all can join in to learn about the great science. Participate in Live from IPY events! Join us for a real-time, Internet “webinar” on 1 May 2008 with Emily Davenport and the research team in the Bering Sea. 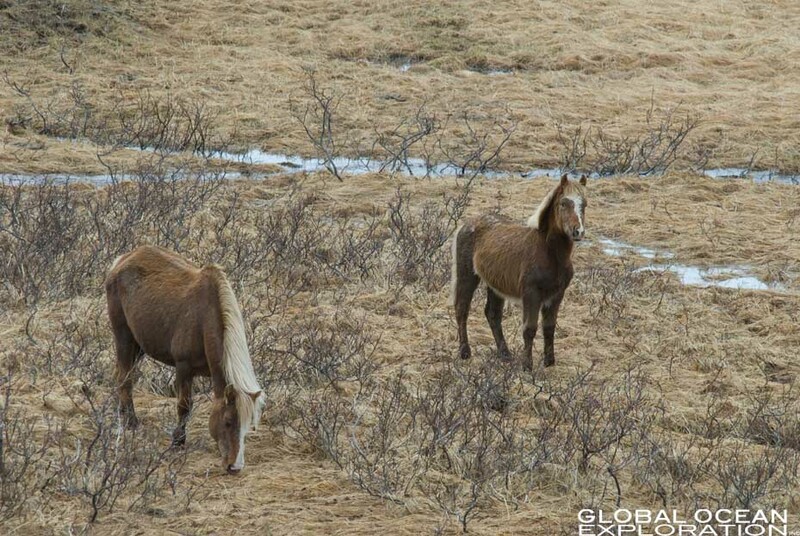 Event starts at 10:45AM Alaska Daylight Time [8:45AM HDT, 11:45AM PDT, 12:45PM MDT, 1:45PM CDT, 2:45PM EDT]. The event will last about 1 hour and participants will get a chance to hear about the research being conducted as well as interact with researchers and Emily Davenport. 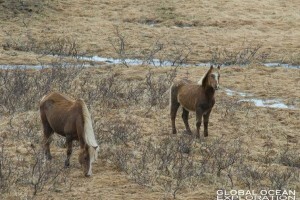 We spent most of yesterday afternoon and evening transiting to our next station where we arrived around midnight. 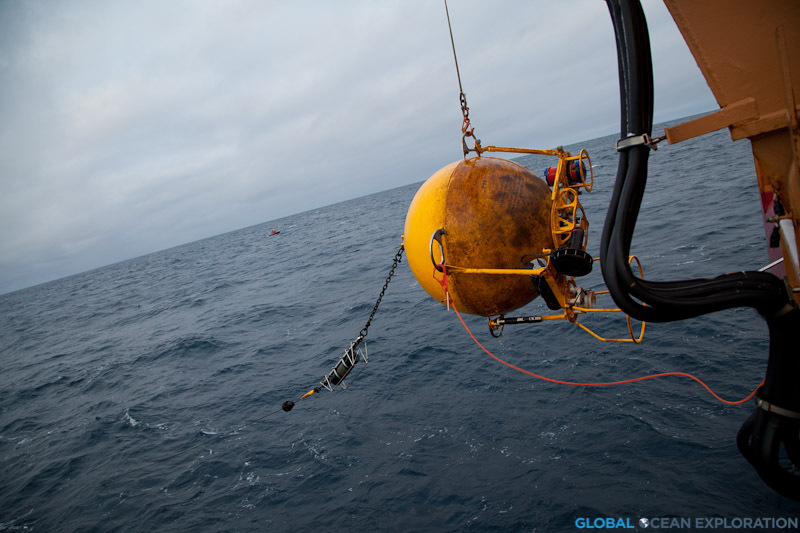 It is a deep station in about 3500 meters of water so all of the sampling times are long as the instruments make their way through the water column. 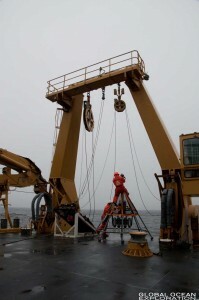 Sampling has continued into the morning with two deep multi-cores happening. Once the second multi-core is up, we will transit to our next station, also a deep station before heading north and hopefully back into the ice. As is customary on research ships when working in a deep-water area, all of the researchers and crew decorated styrofoam cups to send down on the instruments to the depths of the Bering Sea where the pressure is so great that the cups compress dramatically. It is the best souvenir to bring home from a research cruise. 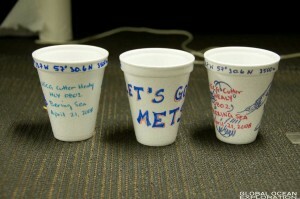 I write the date, cruise number, location, and a few other details on my cup and put it with the other cups to send to the bottom of the sea. I am looking forward to adding these to my collection. 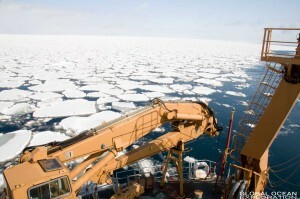 This entry was posted in Arctic, Bering Sea Expedition and tagged Bering Sea, Ice Expedition, oceanography on April 22, 2008 by Gaelin.